Daniel works in the Regulatory Division of the Australian Government Department of Climate Change and Energy Efficiency. This division has the responsibility of administering the National Greenhouse and Energy Reporting Act. The Act is the single national framework for the reporting of information about greenhouse gas emissions and energy production and consumption by corporations and the dissemination of this information to other government agencies. 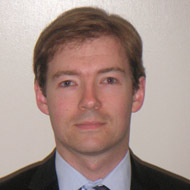 He works in the analysis section which has the role of assessing submitted National Greenhouse and Energy Reports. He completed a degree in Environmental Science after which he worked for several years in a variety of industries while also working for environmental consultancies and undertaking volunteer work. Daniel joined the IES to get a different perspective on environmental matters. "I am also very impressed with the issues that the Institution covers, issues that are important to people who work within the field of environmental sciences for example information on internships and career development, and information on specific environmental issues. From my own experiences one of the greatest challenges was the transition from a university graduate to becoming and environmental professional." Daniel feels there are multiple good aspects to his job, as he is working in an exciting and relatively new field. He works with a range of people including people from other government departments, external stakeholders, consultants and the business community.He is able to use his skills and knowledge in environmental science but also build and develop these skills. Now is an exciting time for his organisation which has the task of capturing Australia’s Energy and Greenhouse Emissions information. The area he is working with is about to become the Clean Energy Regulator which will have the additional responsibility of implementing and administering a carbon pricing mechanism in Australia. This is a significant step forward for Australia in reducing greenhouse gas emissions and moving towards a low carbon future. In the future Daniel would like to continue working in the area of climate change and air quality whether it is in the private sector or for government to use his skills and knowledge and apply these to environmental issues.